Σε πολύ καλή τοποθεσία της Ho Chi Minh City, το Ava Saigon Hotel είναι μια πολύ καλή βάση απ'όπου μπορείτε να εξερευνήσετε την σφύζουσα πόλη. Από εδώ, οι επισκέπτες μπορούν να έχουν άμεση πρόσβαση σε όλα όσα η πόλη έχει να προσφέρει. Από τη βολική της τοποθεσία, η ιδιοκτησία προσφέρει εύκολη πρόσβαση σε κορυφαίους προορισμούς της πόλης. Το Ava Saigon Hotel προσφέρει επίσης πολλές εγκαταστάσεις για να εμπλουτίσετε την διαμονή σας στη Ho Chi Minh City. Κατά την διαμονή σας σε αυτό το υπέροχο ξενοδοχείο, μπορείτε να απολαύσετε τα 24ωρη υπηρεσία δωματίου, 24ωρη φύλαξη, τζάκι, δωρεάν WiFi σε όλα τα δωμάτια, ταχυδρομική υπηρεσία. Ελάτε σε ένα από τα 20 φιλόξενα δωμάτια και ξεφύγετε από τα άγχη της ημέρας με μια ευρεία γκάμα ανέσεων, όπως επίπεδη τηλεόραση, δωρεάν καφές φίλτρου, θυρίδα, καθρέφτης, παντόφλες, που θα βρείτε σε ορισμένα από αυτά. Εξάλλου, το ξενοδοχείο διοργανώνει πολλά ψυχαγωγικά δρώμενα έτσι ώστε να έχετε πολλά πράγματα να κάνετε κατά τη διαμονή σας. Απολαύστε τις ασύγκριτες υπηρεσίες και μια πραγματικά περίβλεπτη διεύθυνση στο Ava Saigon Hotel. The hotel location is few hundred metters aways from. Ben Thanh Market and walking distance to the Central Post Office area. Wreided front door, dominated by their Spa shop. Family run hotel, clean, good value, spacious room. Great for traveller don't mind much about facility, just rest and go. Stayed in suite triple. Comes with two double beds. Room has enough space for 4 people. Room is basic. Floor is tiled. Some lights not working. Kettle is provided in room. Iron and board is not given. We have to send clothes for pressing at their laundry. Each guest is given one free set for laundry (short, pants, underwear). Bathroom amenities are also basic - toothbrush, soap bar and shampoo. Breakfast consists of simple western and Vietnamese dishes - toast, butter, jam, sausages, eggs, corn flakes, waffles with honey, fried noodles, sticky rice, pho, strong coffee, tea, orange juice (not fresh orange), water. Receptionist is friendly and helpful. Restaurants, convenience stores and tour agents are steps from the hotel. The hotel can also arrange tours. Ben Thanh market is 7 minutes walk away. I like this hotel because its easy for me go around this city. They just upgrade our room and i satisfied with their room. Good,convenient for those who didn't expect much.breakfast menu must upgrade.room cleanliness must take good care as our room smells bad. Staff are so nice here. Nice breakfast in the morning. This place is really good it's right in the heart of the city. Staff are very helpful and best is free laundry service for 1 set clothing everyday. The hotel is centrally located in District 1. Guests can enjoy limited choice of breakfast and daily free laundry service. The laundry service is great because finding a laundry place in District 1 can be hard and costly. 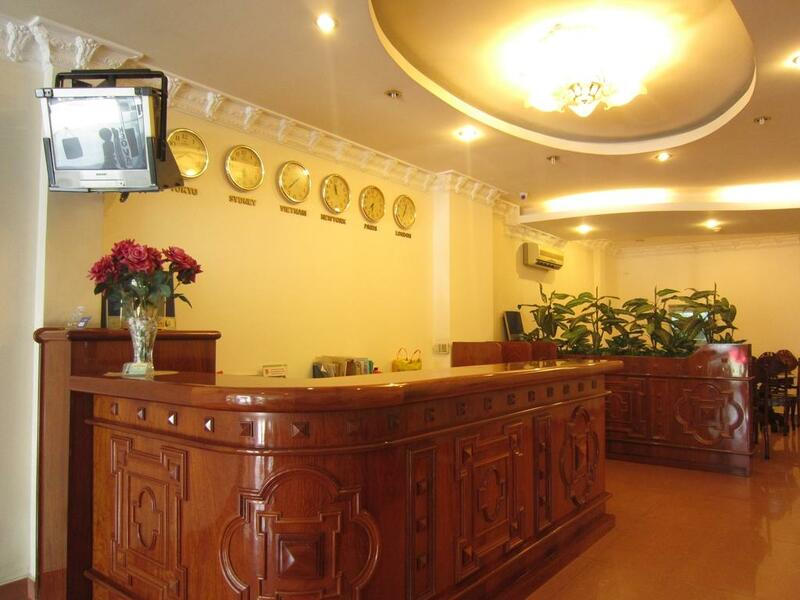 The hotel is located ideally at the center of District 1–close to Ben Thanh Market and a Hindu Temple. There are many Japanese restaurants near the hotel. Guests will enjoy free breakfast and free laundry service. The laundry service is greatly appreciated, for laundry service in District 1 can be hard to find and costly. Overall, I enjoyed staying at this hotel and would recommend it to guests who look for a budget hotel at the center of the District. Love the location, staff, room and of cause their laundry service ! Value for money. But for Muslim is not recommended to eat their breakfast since they also serve something that made from pork. But it is not a big deals since you can get many Halal food at muslim street just 300m from hotel. Overall i really enjoy staying here And will be come back next time. It was 2:00 AM BUT we cannot get inside the hotel because a staff who was shabbily clothed was sleeping at the doorway. The owner came after half an hour and insisted that I should pay a higher rate than what was confirmed by Agoda. I told him that I always pay my Agoda bookings at the hotel upon arrival, citing my previous Korean, American and European travels. Realizing that he cannot pull a trick on me, he upgraded me to a bigger room with no extra cost. With no coordination with the owner, the front desk staff which changes everyday would remind me that I will have to pay their regular rate! They will then slyly smile and spew words in Vietnamese. On the third day, we were cancelling our Cu Chi tunnel tour because we will be picked up at 8:00 AM and had to check out at 7:00 AM before the tour. They will still charge even if you cancel the tour. So, we requested to have breakfast at 6:30 AM instead of the usual 7AM to pack and check out. They rudely say no! FOC daily laundry service provided. 1 set (including 1 top 1 bottom 1 undies) per pax per day. Kids had fun in the bathtub. Do bring your own shower gel if you do not fancy soap. Shampoo & toothbrush are provided. Mekong Delta 1 day tour at VND248,000 (adult) & VND186,000 (child) and Cuchi Tunnel half day tour VND158,000 (adult) & VND118,500 (child) can be booked at the reception. Breakfast is very limited. There is a small alley 5mins walk from the hotel which serves good Viet bun and prawn fritters. Paid for 60min full body massage at salon directly below the hotel but was only provided a max 40min service. Old fashioned hotel in a good location. Staff were friendly in the main and breakfast good. They changed our room on arrival and it was not clean and lacked plugs for chargers and had a kettle which was useless. Noisy from above in middle of night. We moved for the second night and the room was much better. The hotel is OK for the budget travelers. The breakfast has variety of western and Vietnamese choices. We have a complain that when we booked for more days they assigned us in a basement room which was low ceiling and small like a dungeon even it was cheaper. Will we coming back? We’re not sure. The service was very good and the staffs are very accommodated. Good breakfast and free laundry everyday! I was travelling with my parents and husband, we were so happy with the kind of service we received in this hotel. It's near with tourism spots, just few blocks away. Very recommended! Good service. We forgot to bring stroller to HCM City, when we ask where can get the stroller the lady at the counter inform they can get and borrow from someone or other property for us. And their staff drop us to Ben Thanh Market since we are tired and already late, another 8 mins will be closed.Just pay 20k VND per trip for 1 motobike. Not many hotel can give a good service like this hotel. Room with free buffet breakfast and free laundry. This is our 2nd time stayed at this hotel. Sure will come back n stay at this hotel. Suitable for family who has small kids, can send laundry everyday for 1 person head to toe.. This hotel is small but excellent in every aspect. You can see the owner put effort into everything to make customer satisfied: clean room, friendly staff, good breakfasts. This hotel is in a noisiest area of the city but it's very quiet once you get inside. I stayed here twice during my stay in Vietnam. I highly recomend this hotel for someone who looking for a good, fair-priced hotel.